Spring has finally arrived! The buds are slowly starting to appear and the flowers are beginning to bloom! You may notice how there’s a little extra bounce in your step… we feel lighter, brighter, our bodies crave light fresh foods, and it’s also the perfect time for a little self care! With the warmer air upon us, spring is also the perfect season to cleanse or detox! While you might already be familiar with a juice cleanse, did you know that adding a bath to your weekly routine not only helps you to relax but also assists the body in eliminating toxins? Now you may find that you don’t have the time for a bath, as life gets busy and we tend to put others first before we focus on ourselves. However with Mother’s Day around the corner, adding this quick and easy-to-make Mason Jar Bath Soak, is not only easy to make for yourself but it also boasts ingredients that are beneficial for your mind, body, and soul! 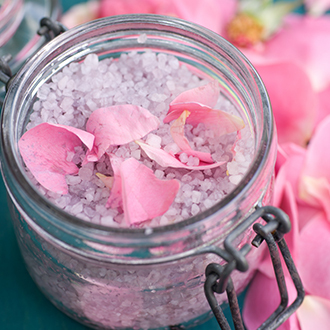 It’s commonly known that Epsom Salt can help relieve muscle pain and relax the body, but did you know that soaking in it can also increase magnesium levels? This is due to the fact that we absorb the salt through our skin, which is also why soaking in Epsom salt naturally relaxes us. The part that excites me the most though is the fact that espom salt also helps us detox! This is due to the fact that the sulfates in magnesium help our bodies flush out excess toxins from our cells! Not bad way to add a gentle detox to your self-care routine! I love adding rose petals to most of my baths, not only does it add a little beauty to your bath, but the soft floral aroma helps to calm and relax the mind. Rose petals are also great for your skin as they help to soften, soothe and moisturize the skin. Almond oil is a perfect addition to any bath, especially after winter! Our skin is usually still in need of some extra hydration this time of year, and due to almond oil’s high content of vitamin E this is a great oil to help soothe and hydrate the skin. When it comes to baths I am a huge advocate of adding essential oils, and the blend in this recipe is perfect for this time of year! Essential oils are derived and extracted from plants and each one has specific benefits as many can provide energy, clarity, calm, relaxation, and improve our overall health. In this recipe I use oils to calm and relax, which lavender is commonly known for. However not only is lavender calming to our mind, it also has wonderful benefits for our skin due to it’s anti inflammatory properties, which is an added benefit for anyone who is suffering from acne, eczema, psoriasis, or any skin disorder. I often recommended chamomile as a bedtime tea, as this wonderful flower can help calm our nerves and relax the body. Chamomile is what I call a “power oil” as it contains many different properties. Not only is it anti inflammatory, and anti depressant (just to name a few), chamomile is also analgesic which is helpful for those who suffer from pain, especially arthritis. If you haven’t tried bergamot before then you are missing out, this sweet citrus scent adds a little spring to this recipe! Bergamot is commonly known for it’s ability to alleviate symptoms of depression, anxiety, and stress. However another great benefit is how it can also help alleviate some respiratory conditions such as cough, phlegm, or nasal congestion. This is also why bergamot is a great addition for those who suffer from seasonal allergies! Lastly, baths are to be enjoyed so you may find it helpful to either listen to music, read, or meditate. Don’t have a lot of time? That’s okay; you don’t have to take a 40-minute bath, just stick to 20 minutes. Also, don’t forget to stay hydrated! Drink a full glass of water before and after a bath! Enjoy! 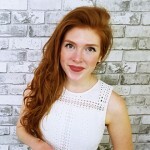 Laura is a Holistic Nutritionist with a special interest in natural skin care. She worked with Healthoholics during 2017 and 2018 in many capacities, but most as a Nutritionist on our sales floor. In a large bowl, add all ingredients together and stir with a large wooden spoon. Once ingredients are all combined fill mason jar, and seal. Note: You may want to add more or less essential oil to your liking. Bonus: Adding ribbon or a label to the jar makes this a wonderful gift for mom!